Sergio Marchionne has responded to recent speculation of a Ferrari SUV, suggesting that a utilitarian vehicle will happen "Ferrari style"
Ferrari boss Sergio Marchionne has confirmed that Ferrari is evaluating the viability of an SUV, but a decision will not be made until at least 2020. Marchionne has previously fuelled speculation, having announced that the Italian supercar maker will "reinvent the concept of a vehicle that has some utilitarian features", suggesting recent rumours of a Ferrari SUV are true, although the brand remains characteristically secretive about the model. However, despite Marchionne's comments, a Ferrari spokesman said: "With reference to recent speculation in the international press, Ferrari will not be launching an SUV." It was reported in July that the long-rumoured Ferrari SUV was still on the cards. 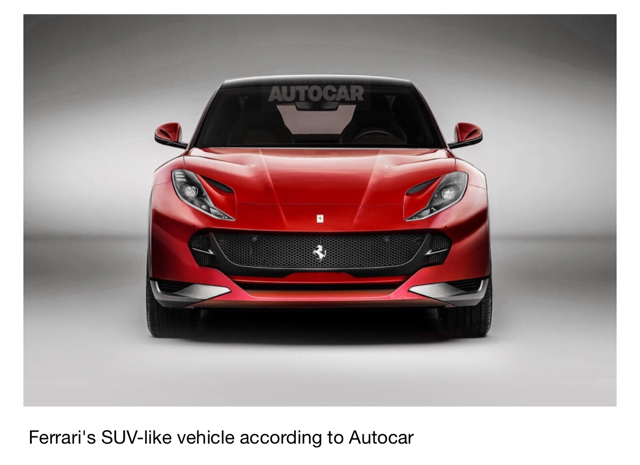 Auto analyst Max Warburton claimed the future model is being called an FUV (Ferrari Utility Vehicle) and does not have visible rear doors. However, Warburton claimed it is a “question of semantics”, stating that while Ferrari management continues to tell investors that it will not build an SUV or a model with four doors, the rear doors will not be visible and will instead “use a clever hidden arrangement”. The model, expected to launch in 2021 and cost about £250,000, would rival cars such as the Lamborghini Urus, Rolls-Royce Cullinan and Aston Martin DBX. Warburton estimates that 2000 to 3000 units would be sold per year. While Ferrari continues to be evasive on the topic, a more practical model has huge potential for the Italian brand, given the trend for high-riding vehicles and the popularity of ultra-luxury SUVs worldwide, and particularly in the growing Chinese market. Competitors Lamborghini, Rolls-Royce and Aston Martin are already far into development of their respective SUVs, while Bentley’s Bentayga accounts for a significant portion of its sales. Back in August, Ferrari CEO Sergio Marchionne hinted that the Maranello brand may well build an SUV of some sort after all, despite having earlier ruled out the move. And now the 65-year-old has all but confirmed the latest speculation. According to Bloomberg, Marchionne said that Ferrari was past merely considering building a utility vehicle, adding that it would take around 30 months to decide on production. He said that the vehicle would be limited to ensure exclusivity. “We’re dead serious about this,” Marchionne told reporters, describing the model in question as an “FUV” (Ferrari Utility Vehicle) rather than SUV. Reports from July, of course, suggested Ferrari was working on project F16X, a high-riding crossover being developed alongside the next-generation GTC4Lusso. “We need to learn how to master this whole new relationship between exclusivity and scarcity of product, then we’re going to balance this desire to grow with a widening of the product portfolio,” he explained, according to Bloomberg. Marchionne, who is also Fiat Chrysler Automobiles CEO, went on to add that the group would not consider selling Jeep as a separate entity, shooting down reports that he was on the verge of an agreement with Great Wall Motors. Why stop there?! Why not build a bakkie? Or a hatchback. Everyone is looking at this the wrong way. Ferrari have simply found a new and green way to power their factory. By attaching the corpse of Enzo Ferrari to a generator and making a Ferrari Utility vehicle, they will be able to create all their cars in a much more environmentally friendly way. Ferrari’s first production series hybrid will launch in 18 months’ time, company boss Sergio Marchionne has confirmed. It’s not yet clear which model the hybrid will appear in, although the timing would suggest it could well be Ferrari’s much-hyped forthcoming SUV, which is rumoured to be coming next year. It’s unclear whether the new hybrid will run with Ferrari’s V8 or V12 engine. In terms of meeting CO2 emissions, the V8 is already turbocharged, helping lower emissions. Therefore, the V12 could make more sense, especially because Ferrari is keen to keep that engine naturally aspirated. A hybrid could be one way to achieve this, while meeting emissions targets. Marchionne also confirmed there will still be internal combustion-engined cars in future, which sit alongside a growing number of hybrid models. Eighteen months before Ferrari’s first production series hybrid arrives on roads, footage of a test mule running the powertrain has been captured at the Italian firm's Fiorano Circuit. Company boss Sergio Marchionne confirmed that test mules running a V8 hybrid powertrain were in use earlier this month, and the new video shows that at least one mule is based on a 488 GTB. The car has no audible engine tone, suggesting that the powerplant is a plug-in hybrid one to enable fully electric running. Marchionne said that the electrified powerplant will need to be a “traditional hybrid to fulfill its role”, in comparison to the LaFerrari’s kinetic energy recovery set-up, which was used as “an add-on”, essentially giving performance benefits rather than efficiency gains. The car is most likely to adopt a plug-in hybrid system to offer a limited amount of pure electric driving and lower CO2 emissions to achieve those targets. Such a model will directly rival Lamborghini's Urus plug-in hybrid which will arrive before the turn of the decade. There were no further details on power or efficiency, but when asked if a hybrid powertrain meant loss of character versus a V12, Marchionne said: "Have you driven a Ferrari hybrid? When you do, I'm sure you won't miss a V12." Under the guidance of new CEO Louis Carey Camilleri, Ferrari will launch no less than 15 new models by 2022 with the rather controversial SUV coming towards the end of this plan. A substantial 60 per cent of the Italian firm’s products will feature hybrid technology within the next four years and key to that will be the development of a new V6 hybrid powertrain, which Ferrari has confirmed is under development. The boss would not mention if the new V6 engine would be used for the new generation Dino but did say that the engine will be used as a lower performance entry point for models such as the Portofino. The product portfolio will be made up of four key pillars; Sports, GT, Special Series and hypercars. The sports range is currently made up the 488’s and 812 Superfast but will grow to include an additional mid-engined model said to be ‘a real supercar in the standard range’ which will have ‘more performance than a LaFerrari’. By 2022, all models in the Sports range will be hybrid thanks to technology stemming from the F1 team. The SUV which is currently known as Purosange will join the GT range and feature new plug-in hybrid tech. A LaFerrari replacement (new hypercar) is not in the brand’s mid-term plan but the company did confirm work is under way on the technology that will feature in its successor. Elsewhere, Ferrari also said it will continue to develop naturally aspirated V12 engine (hooray). Ferrari has laid out its future product plan under the leadership of its new CEO, including 15 new models by 2022 and a hybrid-dominant range. The revised plans, described as "ambitious but do-able" by new chief executive Louis Camilleri, aim to secure the company's future and raise profits from €1bn (£890m) to €2bn (£1.78bn) by 2022. An increase in margins is also targeted, up from around 30% currently to 38%. In the next four years the Italian car maker will split its product portfolio into four pillars: Sports, GT, Special Series and a hypercar range, dubbed 'Icona' initially. The long-mooted SUV will be part of the GT range, using plug-in hybrid propulsion. No specific date for its launch has been revealed, but it's a model that will arrive closer to 2022 than today. The Sports series, which currently comprises the 488 and 488 Spider, plus the 812 Superfast, will be joined by a new mid-engined model set to be "a real supercar in the standard range". The rest of the Sports series range will move fully to hybrid power by 2022, with the new car set to sit above the 488 in the range. The smaller Dino, it appears, has been sidelined for now in the new plans. A replacement for the LaFerrari hypercar was not detailed in the product plan up until 2022, but it's understood work has begun on the successor's powertrain technology. Naturally-aspirated V12 engines will still be offered, with development of the current twelve-cylinder units already under way. Work has also begun on a new six-cylinder engine, set to use a V6 layout with a combination of turbocharging and hybrid technology to boost performance. It's not clear yet which specific models will use this powertrain, but it'll be a key component in Camilleri's plan to have hybridisation across at least 60% of Ferrari's range by 2022.
got to show those kardashians, ferrari can still be balling. a car for those with more money than brains. Ferrari has finally confirmed that it will indeed be building a “utility vehicle” (like Rolls-Royce, the Maranello-based brand isn’t terribly fond of the term SUV), revealing that it will be called the Purosangue. Purosangue is an Italian word meaning “thoroughbred”. The five-door vehicle is set to launch in 2022 and will ride on Ferrari’s front mid-engine platform, featuring variable ground clearance and the option of a hybrid powertrain. 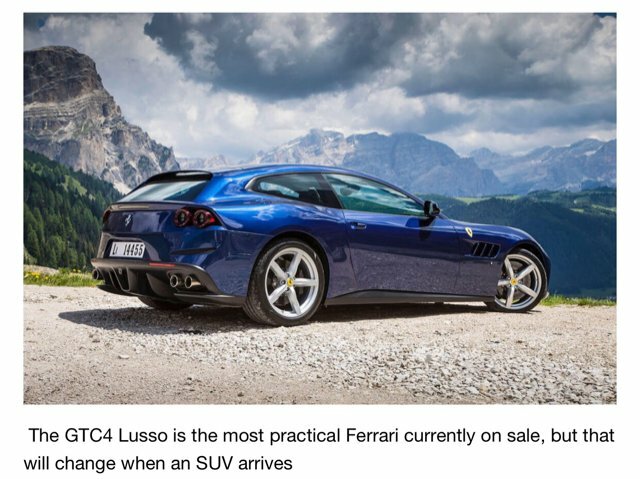 “I abhor hearing SUV in the same sentence as Ferrari,” Louis Camilleri, the Italian brand’s CEO, said at a business presentation, according to Automotive News Europe. “SUV just does not sit well with Ferrari,” he added. While Camilleri claimed he was initially “skeptical” about the idea of an FUV (Ferrari Utility Vehicle), he is now firmly on board. “Having now seen the wonderful design and the extraordinary features, I am a hugely enthusiastic supporter,” he revealed, adding that the Purosangue will be “expensive, rest assured”. In October 2017, the late Sergio Marchionne all but confirmed that an FUV was on the cards.